The TPS Foundation annual employee capital campaign culminated with the superintendent awarding an extra day of personal leave to Topeka High teacher Steve Holloman. Each year, in support of the Foundation, the superintendent encourages employee contributions to the Foundation and sweetens the pot by offering an extra day of personal leave as incentive. Jeremy Gibson, NEA-T president, drew the name of this years winner. 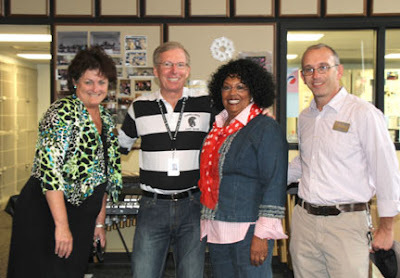 Superintendent Julie Ford, Foundation Executive Director, Pamela Johnson-Betts and Jeremy Gibson made a surprise visit to Steve's class to inform him of his win. Congratulations, Steve! Thank you to all who donated to the TPS Foundation during this year's campaign. Pictured left: Dr. Julie Ford, Steve Holloman, Pamela Johnson-Betts, Jeremy Gibson.